I made a trip to the McClellan Airforce Museum in Sacramento today. Why? 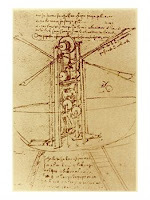 To view the very cool exhibition that showcases physical models of the many inventions Leonardo da Vinci created in his sketchbooks. While most people today recall Leonardo as a famous painter, not quite so many understand the amazing contributions he made to fields we know today as physics, science and medicine. Did you know he was the first person to illustrate the blood flow through the human heart and render the functioning of the aortic valve? Leonardo was one of those anomalies. A person who, despite being a social outcast due to his illegitimate birth and homosexual activities, had a passion for exploring, understanding and creating. Central to this flourishing of brainpower was good ol' pen and ink drawing. Yep, that's right folks. Leonardo never went anywhere without his notebook. Many of the pages are still with us today, although now dispersed into museum collections (including Bill Gates'). A close study of the pages reveals his passion for exploring the visual world around him. He was always drawing something...a person with a unique face, the flow of water, an expression, vines, even wind. His healthy exploration of life, grounded in the visual arts, included sketches of inventions that never came to fruition. These include several "flying machines" (like the one shown here) which were hundreds of years ahead of their time. So what lesson can we learn from Leonardo? Well, folks, how about the importance of art in education? When art is integrated into learning, ideas flourish. Research has proven that integrated arts education results in higher academic test scores. You'd think this evidence would turn heads, wouldn't you? Art engages your right brain. We are and have been for the last century a left-brain, knowledge-based society. This has and continues to change. As Dan Pink, author of A Whole New Mind, has argued, we are now in a conceptual society and individuals will need engage both sides of that oh, so important brain to succeed. YouTube, MySpace, Flickr, del.icio.us, (if I was younger I could list more!) are all examples of conceptual, creative inventions that have transformed the way people are socializing. Corporations today are outsourcing their left-brain tasks (phone support, computer repair, customer service, etc.) to Asia. Heck, why not? Labor is cheaper there we're a society driven by capital. So, where does that leave those of you in school right now trying to decide what to do with your life? Do NOT underestimate the importance of creativity in your future. Take an art or design class. It could be the best investment you make for your future.